Children’s books with light switches, wafer-thin luminous tiles and handbags with inbuilt mobile phone chargers – when printing meets electronics, many wishes may come true. The new methods promise diverse potential applications, inexpensive production and mass market appeal. 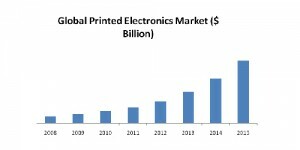 Once confined to the laboratory, Printed Electronics has now become an industrialised field with huge market potential in a wide range of sectors. Messe Düsseldorf is responding to this trend and organising the special show PEPSO – Printed Electronics Products and Solutions at six relevant trade fairs at the Düsseldorf exhibition centre. “Printed Electronics is becoming attractive in many user sectors for which Messe Düsseldorf stages the respective flagship fairs. In establishing PEPSO, we have therefore given the subject a platform of its own and are integrating it in the trade fairs for the retail trade, glass processing, packaging, printing and medicine,” says Hans Werner Reinhard, Deputy Managing Director of Messe Düsseldorf, explaining the strategy. “We’re in an ideal position to offer producers of Printed Electronics marketing showcases for specific target groups.” PEPSO showings are planned at the following trade fairs: COMPAMED 2013, EuroShop 2014, EuroCIS 2014, glasstec 2014, interpack 2014 and drupa 2016.Current information on PEPSO can be found at: www.pepso-global.de. With the goal of mutual support in the field of printed electronics products and solutions, Messe Düsseldorf and ESMA, the European association for specialist printing manufacturers of screen, digital and flexo technology, have now entered into strategic cooperation. “The printing industry is ready to vertically integrate Functionality and Electronic applications. This agreement is an ideal opportunity for the printing community to embrace the many industries and markets covered by Messe Düsseldorf’s range of world class exhibitions,” explains Peter Buttiens, CEO of ESMA. The two partners will network their public relations and internet activities, market each other’s events and present themselves at the relevant partner events. Messe Düsseldorf will be represented with an information stand at the coming AFIP – Advanced Functional & Industrial Printing – in Düsseldorf on 6 and 7 March. In return, ESMA will be presenting itself at the relevant Düsseldorf trade fairs.